Enter the future with the Seatcraft Innovator, a brand-new design in home theater seats that will bring you right into the 21st century. Its research and development incorporates the latest advances in technology with classic, timeless features to produce an all-in-one entertainment experience. Sit back with the Innovator and never have to worry about another home theater need again! The Innovator comes in several different configurations: a row of two, row of three, row of three sofa, and row of four. 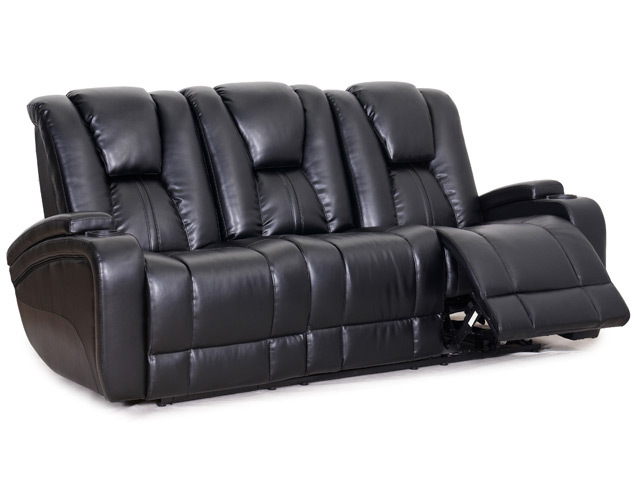 In any one of these options, it is a roomy, elegant model crafted from bonded leather. The bold, elegant shape in coffee or black will match any home theater decor and be sure to catch the eye of anyone who enters the room. 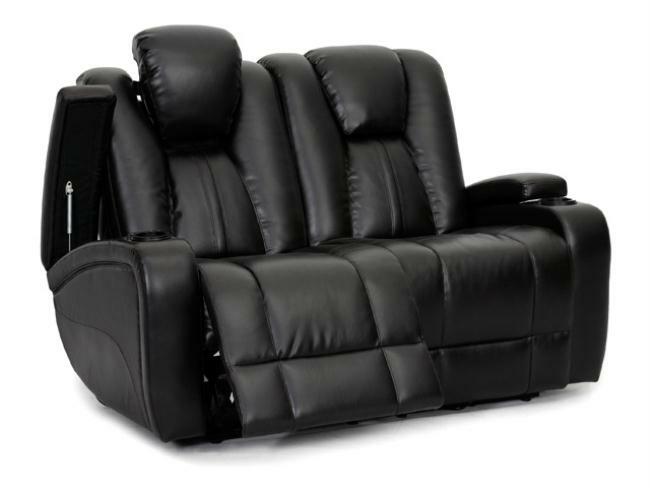 Experience the perfect combination of comfort and support as you sit back against its plush seating, or use the chaiselounger footrest to support your body as you lay back with ease. The row of three sofa configuration, however, features much more. Flip the middle seat forward to reveal a futuristic center console panel made from elegant burlwood. 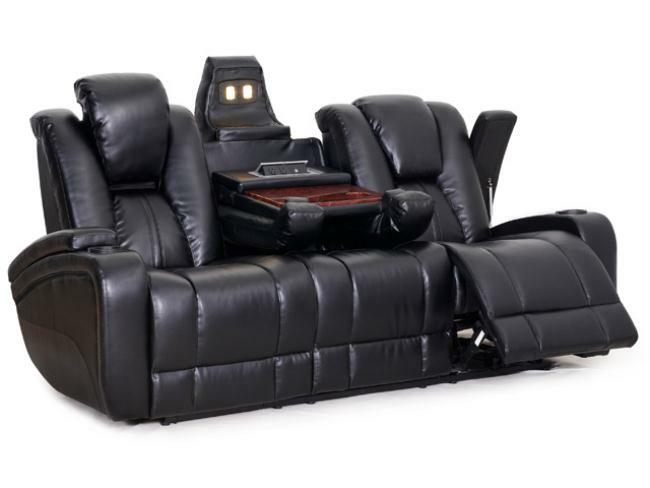 An overhead lighting panel illuminates this console, which features dual cupholders and plenty of tray space for the placement of iPads, reading materials, snacks, or anything you will need for maximum moviegoing enjoyment. Lighted cupholders on the side armrests will emit a warm ambient glow. In addition, 2 AC adapters and 2 USB ports inside a pop-up input plate allow you to plug in any electronic device, from tablets to cell phones. Use your tablet to hook your entertainment system to the internet, for a new dimension in entertainment. The features don’t end there: each lighted cupholder also has easy push-button controls for power recline and adjustable headrest options. Use the power recline to maneuver into any desired position, and stay there. Adjustable headrests also afford a range of head placement options, so that you are never in the slightest discomfort. Finally, side armrests feature ample inner storage space. Power recline, adjustable headrests, and inner storage space also highlight the row of two, row of three, and row of four configurations. The row of two features one storage console, the row of three highlights two storage consoles, and the row of four with center loveseat also features two storage consoles. The row of three sofa is the configuration which features the burlwood table, AC/USB plug-ins, and overhead lighting. Whichever configuration you choose, the Innovator will be sure to astonish your friends and satisfy your every home theater need.